This neighborhood restaurant clearly states that its ingredients are fresh and food is made from scratch recipes. You can see the tenderizer through the kitchen door when walking in, any visitor can expect a fresh tenderloin. The menu prominently uses the American and Italian flags, both cuisines are represented on the large menu. Location: 2700 E. 17th Des Moines. At the Corner of East 17th and Easton Blvd. 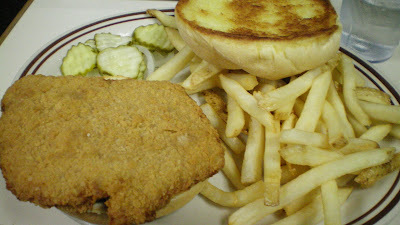 The Tenderloin: The large size is a half pound pork loin cut inside the cafe and hand breaded. There is a good asymmetrical shape and nice uneven depth. 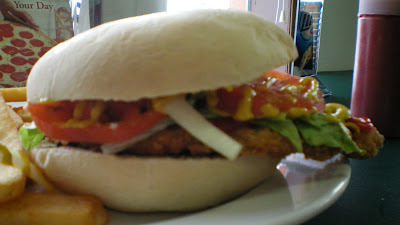 It ranges from thick in the center of the loin shape to just a bit thinner outside the bun. The thick parts had a little more chewy fat in my sandwich. 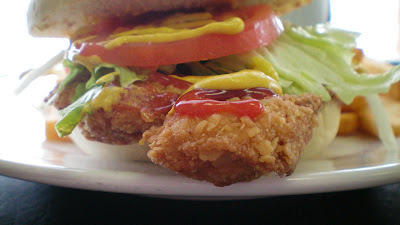 The breading is modestly crunchy, and doesn't separate from the pork inside. Moisture is inside the tenderloin and does not form drips. This is served with the fixings thrown on top, other places charge for that. 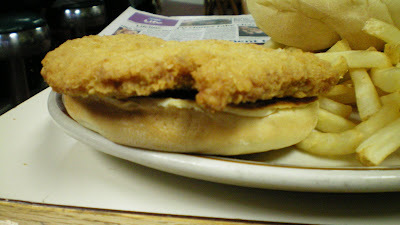 Served on a freshly baked toasted bun which is warm throughout and nearly as large as the tenderloin. Overall: A magnifico 7/10 . 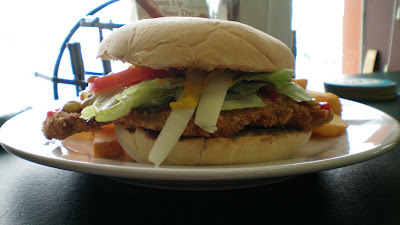 Price: $6.95 with fries or onion rings (homemade). Also available in 1/4 lb. Size for $4.95 or served with chili or cheese for an extra charge. Italian Tenderloin with sausage, onions, peppers, and cheese also available. Service: Table service, although you are never far from the counter. Also on the Menu: Loose-meat burgers, Italian sausage sandwiches, pizza, ribs, and Italian dishes like Manicotti Formaggio and chicken tortellini. Ambiance: The eating area is small, and the colors of all the tables and chairs don't go too well together. Plants are hanging around, and there is a flat screen TV. This is a neighborhood hole in the wall on Des Moines Eastside. Final verdict: This is a nice neighborhood family restaurant with a good and fresh tenderloin. 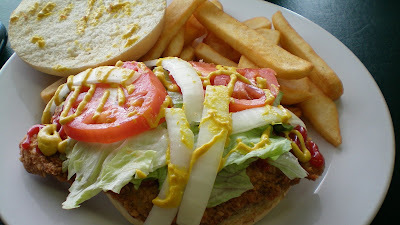 The menu clearly states Real Tenderloin, and does not disappoint. Don't be fooled by the sign marked Gifts and Snacks, this is a full bar and restaurant. 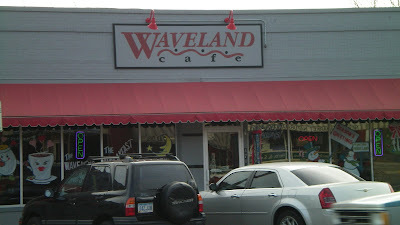 The Waveland is a neighborhood institution on the west side of Des Moines, I have been sent here by plenty of people who know I am looking for tenderloins. Its the kind of place which presidential hopefuls visit to "get in touch" with the common people. Sadly, I would never vote for this tenderloin. 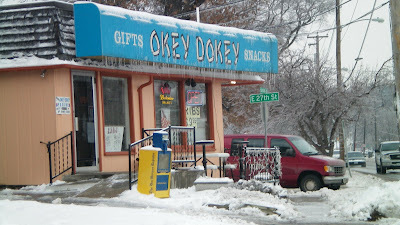 Location: 4708 University Ave. in the West side of Des Moines. Directions: Just drive west on University Ave, on the way to Windsor Heights. Price: $7.25 with fries, its not cheap. Service: table service with waitresses who always seem to be busy. Ambiance: The dinner area is painted brightly, and there is always something noisy going on. The weekend and after-church crowd will form a line out the door for breakfast. Also on the Menu: Hot beef sandwiches, several breakfast items sold any time. Closing Comments: This is a nice diner with a dedicated following, just don't order the tenderloin.